As a young bride from New York City transplanted to Lebanon, PA, my mother was slow to embrace Pennsylvania Dutch cooking. In culture shock, she couldn’t even communicate with the landlord, who spoke “Dutch”. 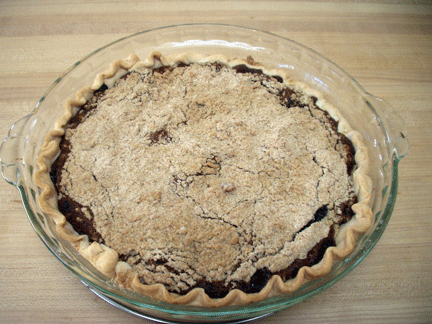 Nonetheless, over the years she developed this delicious recipe that still gets a laugh when I refer to it by name, “wet bottom shoofly pie”. A classic Pennsylvania Dutch favorite, it “schmeckt gut”, tastes good! Mother’s Day comes up this Sunday. Happy Mother’s Day. If you are lucky enough to have yours, embrace her and tell her how much she means to you. 2. Beat the egg yolk in a small bowl. Blend in the molasses. 3. Boil the water and dissolve the baking soda in it. Stir in to the egg yolk and molasses. Set aside. 4. Combine dry ingredients. Add butter and work into crumbs with your fingers. 5. Pour liquid into pastry crust and evenly sprinkle crumbs on top. 6. Bake for 10 minutes at 400 degrees, then lower heat to 325 degrees and bake for another 30 minutes. I came here through Greg@SippitySup and was pleasantly suprised when I read about you. I grew up in Michigan and now also live in beautiful San Diego. I work as Chef for a non-profit and helping children choose healthy food options is my passion. Your site is lovely! I went to Kalamazoo College, as did my maternal grandpa and great-uncle. Let’s connect! What a sweet sweet post. Your mom was gorgeous! Hugs my friend. Thank you to your mom for raising you to be the amazing woman that you are. Maybe I should not have reposted a post – but so fitting! Your post touched me. My mother is ailing in Serbia, and I cannot be there to hold her hand. You are so right, I should tell her how much I love her every day. Have a great weekend and enjoy your relatives! Hoping your mother recovers and that you can be together soon! Such a sweet post. I lost my Mom last year and it’s so much harder than I ever imagined. This pie sounds like wonderful comfort food. I wish I could make you this pie – it is comfort food and so easy to bake. 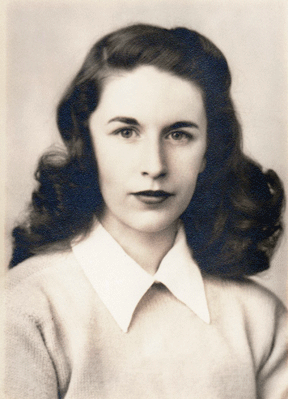 I’m so sorry about your mother – such a huge loss. What a lovely picture of your Mother! Such a lovely post. So wonderful that you have your mothers recipes, such treasure! Thanks, Jayne, I remember spending “Mothering Sunday” with my mother when we visited Cornwall together. It’s in March, isn’t it? Yes it is March in the UK! I think that is so important to pass on these recipes. I have never even had shoofly pie. I always imagine who and why someone came up with the recipes I am creating. I love the history and love that each generation adds to a recipe. Your beautiful mother added her lovely touch to it. I will have to make it. What was your mother’s name btw? Thanks, Elizabeth, my Mom’s name was “Marilou” a combination of her two grandmother’s names. Happy Mother’s Day to you, friend!